Kleihues continued the exterior lines into the interior architecture with clear forms, warm colors, and elegant furnishings. The various public spaces, such as the reception area, lobby, and restaurants, are spatially integrated without losing their independence in the process. On one hand, each space is centered upon itself, symmetrically arranged, and thus clearly defined, yet on the other hand, the individual areas flowingly merge into each other. Uniform form features that extend across all areas create a calm, clear atmosphere. 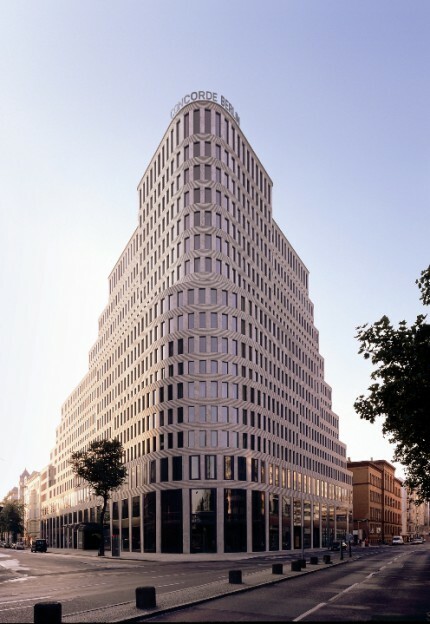 Kleihues has already received numerous awards for his design of the Hôtel Concorde Berlin, for example from the architecture magazine AD Architectural Digest, which selected the hotel as the number one style highlight in Germany.